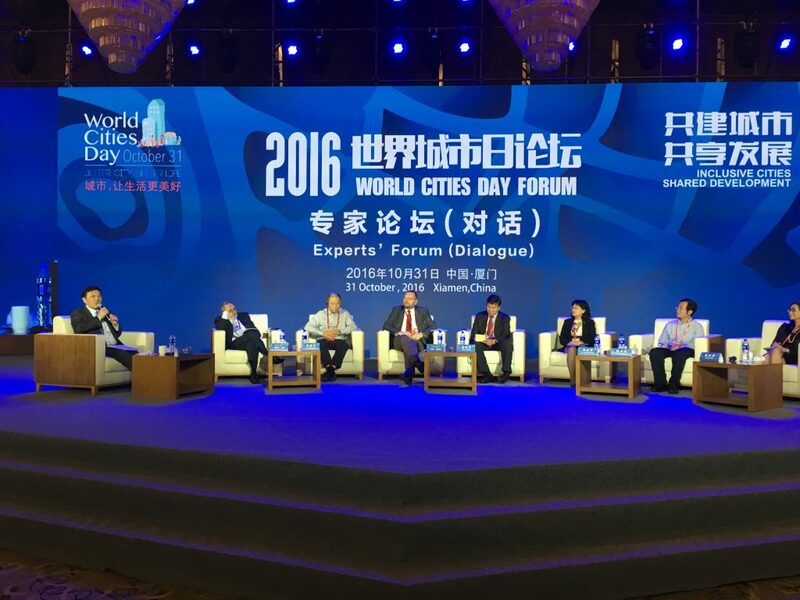 The Ministry of Housing and Urban-Rural Development of the People’s Republic of China, UN-Habitat and the Fujian Provincial Government hosted World Cities Day Forum in Xiamen, China, on Monday the 31st of October 2016. 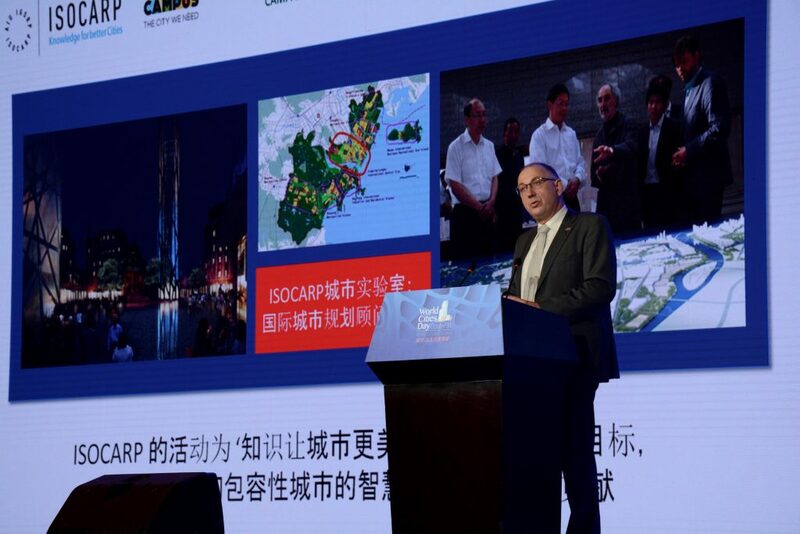 Martin Dubbeling, Vice-President of the International Society of City and Regional Planners (ISOCARP), was invited to give a keynote speech on this prominent international event, with hundreds of international en Chinese delegates. The United Nations selected ‘Inclusive Cities, Shared Development’ as the theme of this annual event in order to highlight the important role of urbanization as a source of global development and social inclusion. Mr. Ban Ki-moon, Secretary General of the United Nations, and dr. Joan Clos, UN-Habitat Executive Director, opened the World Cities Day Forum with video messages emphasizing that the Sustainable Development Goals and the New Urban Agenda, recently adopted in Quito, are very important to make better, sustainable, inclusive and peaceful cities. ISOCARP Vice President UPATs Martin Dubbeling was invited to present how the activities and the motto of ISOCARP ‘Knowledge for better Cities’ contribute the enhancement of Inclusive Cities and Shared Development. 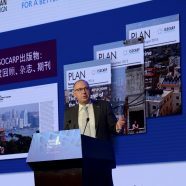 In his keynote speech he stated that there is no other disciplines than urban planning and urban design that have the capacity to implement most of the 17 Sustainable Development Goals. To illustrate this statement he presented the results of the UPAT workshops in China and Palestine. Immediately after his keynote, Martin Dubbeling took the initiative to present hardcopies of the three Magazines with the results of the Gaza and West Bank UPAT Workshops to dr. Aisa Karibo Kacyira, Assistant Secretary General and Deputy Executive Director of UN-Habitat. She happily accepted the three Magazines, complimenting ISOCARP with the results and with the three publications. 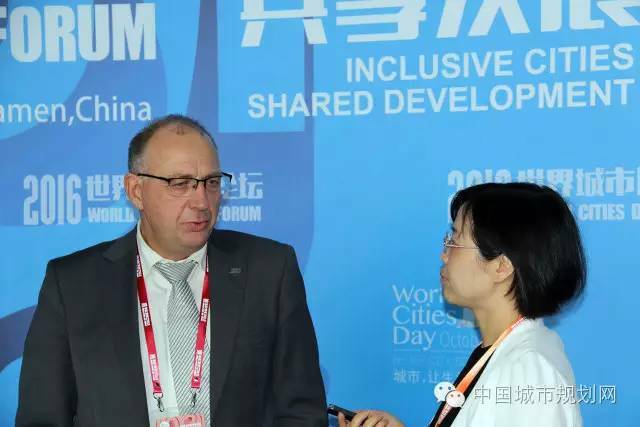 After the keynote speech a journalist of the Urban Planning Society of China interviewed Martin Dubbeling. How could we implement the New Urban Agenda and what is the importance of World Cities Day? “Let me first say that New Urban Agenda is not new at all. The New Urban Agenda is not that much of a new agenda. I have not read one new element, topic or common goal in the New Urban Agenda. The New Urban Agenda is nothing more than a very helpful update and at World Cities Day we discuss what we now think is right how to develop our cities. In the last two decades, our profession has changed a lot. Our profession of urban planning and urban design is very dynamic. It is a profession that is closely related with developments in our economy and that follows trends in technology and society. What 20 years ago was a good idea how to develop cities, could very well be a bad and out dated idea now. What seems to be a bad or impossible idea at this moment could be a very good and successful idea in 20 years from now. How could a professional planner play a key role in the implementation of the New Urban Agenda? “Well, as I said in my keynote at the World Cities Day Forum, the role of urban planners is changing constantly. The planning practice I am involved in now is not to be compared with 25 or 30 years ago when I left university. It comes with our profession that we as planners have to reinvent ourselves, and constantly we have to reconsider what our role as planners is or could be in the future. But in our case, our field changes. Cities in China are so completely different from cities in Europe or elsewhere in the world. We have to understand that there is no universal answer to it. As planners, we have to be very adept. We have the role of counsellors and doctors of future cities, and on a very regular basis we have to update ourselves and our profession for the better good of our cities. As planners, we have to make a turn of 180 degrees. Instead of looking for practices from the past, we also have to look at the possibilities for the future. Developments in society, technology, economy, and mobility are changing the cities very fundamentally and rapidly. In the past decades our cities already have changed beyond imagination and I believe that technology and mobility will change our cities even beyond recognition. Nevertheless, I am sure that successful cities will be the drivers for the future economy. The better these cities care for their inhabitants, the more successful and competitive these cities will be. The New Urban Agenda is much more than the implementation of goal number 11 – Building Sustainable Cities and Communities – of the 17 Sustainable Development Goals of UN-Habitat. In order to make cities successful, healthy and competitive, it is imperative to implement all 17 Sustainable Development Goals. The New Urban Agenda provides a clear direction in how to achieve and implement all this in the next decades.